Good Morning Authentique and Petaloo Fans, Heatsher here to share with you a cute stocking decor/gift wrap that you can make using some paper grocery bags that you have lying around. To start, I grabbed a leftover kraft grocery bag. Kraft postal wrap works great for this too. Just draw out a stocking, making sure that you double the size of the cuff of the sock. The cuff will be folded over (just like a real stocking). If you want a stocking that can be filled, make sure you use two layers of paper. Cut out your stocking. 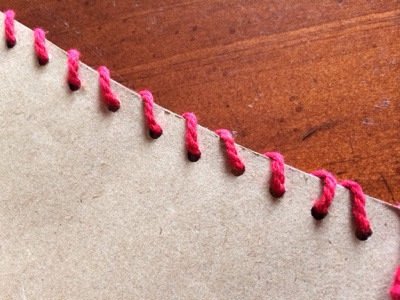 Fold over the cuff, and trim or perfect as needed. 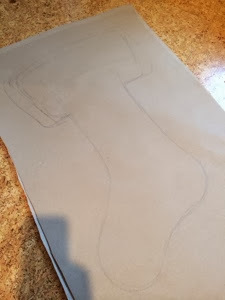 If you are freehand drawing this, don't worry too much about making it perfect. Once you decorate, any imperfections will not be seen. 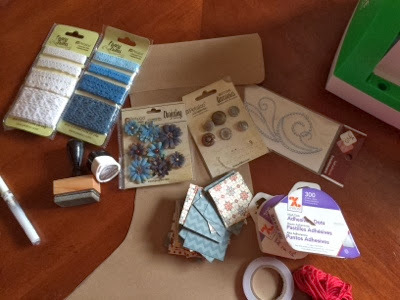 Gather all of your supplies, trims, flowers, buttons, and adhesives. Cut your papers to size. I chose 2" squares. Lay them out so that you know how many of each pattern you will need. 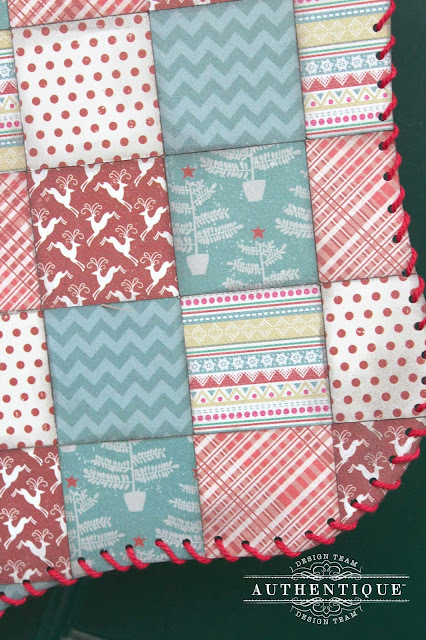 For the squares, I chose Tinsel, Chimney, Medley and Rudolph from the Tradition Collection. To adhere each of them, I used my Xyron 9" Creative Station to make sure that there was adhesive was evenly on each square. I also really like inking stickers instead of paper (as I can stick multiples to my fingers at once and ink quickly). As you can see, I changed up the pattern a bit as I stuck them all down. I wanted a little more of a patchwork pattern. Each square is inked separately before being stuck down. There are pieces that are hanging off, and those will be cut off when the stocking is fully decorated with squares. Once the extra is cut off, ink the edges in the same color as you used for each square. For this, I used Memento's Rich Cocoa. To make this really sturdy, I used Xyron's 1/4" Double Sided Tape. 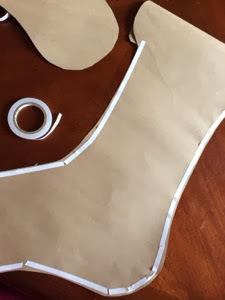 You can curve it slightly, or cut it into multiple strips as needed. Attach the other stocking. See!! It can totally be filled with some fun items! I decided that I really wanted this stocking to stay together, and it needed some more decoration, so decided to add some more trim to the edge. 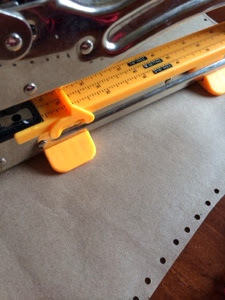 I used my Crop-a-Dile to punch holes into the edge. Then whipstitched red cording around the entire stocking. For the hanger, I grabbed a piece of Medley paper, scored it lengthwise, then ran it through my Xyron 9" Creative Station, folded it onto itself and inked the edges. To attach it to the stocking, just staple it onto the back. To make this hang on hangers, eye hooks or nails, you can also punch a couple of holes onto the back of the hanger and thread cording through the holes and tie onto whatever you are going to hang the stocking onto. For the decoration, I used Petaloo's Crochet Lace Fancy Trim. 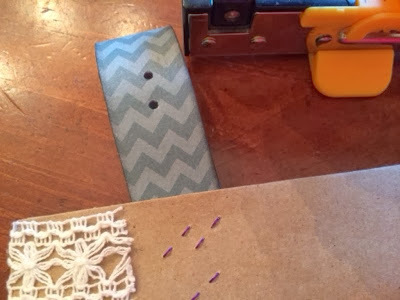 I used the largest trim for the top of the cuff, and layered two layers of one of the thinner trims for the bottom. To mute the white tone a bit, I inked the trims just a tad. I then used Darjeeling Mini Mix in Teastained Blues and Vintage Buttons to add some more detail. Here's a closeup of the patchwork patterns and the whipstitching. I can't decide whether I'm going to keep this and use it for some cute decor, or stuff it full of Christmas wonders and gift it to a sweet friend! This stocking better not have any coal in it ... much too beautiful for that! Thanks for the tutorial! I was so surprised at how beautiful the finished project was ... along the way I was expecting something far folksier. It's just lovely - and I adore it! Great design ... and I love the upcycled brown grocery bag! Charming work! Why do I have to go to work today??? I want to play with paper!!! how cute is this. I love the lace on top. And the "Quilting ". Just love. This could be a great craft project with my granddaughter. She loves to craft. 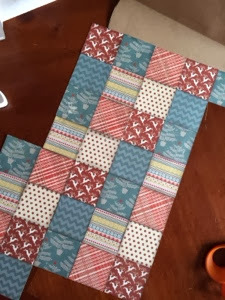 Patchwork paper - it's a fabulous project! Great stocking. A good way to use up scraps. You don't need an expensive base for the stocking. Love it. Thanks for the tutorial and the idea. WOW!! This is perfect for the holidays! I am truly inspired. Will definitely give it a go for Christmas this year. Great idea!! The stocking is just beautiful!! Thank you for the chance to win. Love your choices of patterns for papers. They work so well together, but how do you get them to stick on so evenly. I have used xyron also and I can never get my rows to be that even. I guess my hand is not steady enough. What a fabulous idea....Love it! thank you for the inspiration! The sock project looks like so much fun to do! And an excellent way to use scrap paper! Pinned it! This is so pretty and an awesome way to get rid of all those bits of paper left over from making Christmas cards. TYFS!! fun to give or receive. Very clever using a paper bag..the squares remind me of a quilt pattern! Love the patchwork. Great project. This stocking is absolutely adorable Heather! Thanks so much for the tutorial! So well done! and so doable. Thank you so much! I love this stocking! Thanks for sharing. Very cute and so clever for a door instead of a wreath. Fun tutorial. Thanks for the great idea. Wonderful stocking, Something new that I could send in the mail to my grandchildren in CA. Thanks so much for the detailed tutorial. Very cute. I love the papers you selected! Love Authentique products and the patchwork stocking. Your stocking is absolutely adorable! This would be a great way to give Secret Santa gifts! Every Christmas Eve I go around to all of my nieces and nephews and grandchildren's houses and leave little gifts from Santa for them to open that night before bed. This year I am going to make a few of them for them and put a few little goodies inside and hang them on their doorknob when they are not home as their little surprise! So far nobody has guessed that I am the one who does this. I wait till they are at Christmas Eve Mass to do it. At one point I was doing this for over 25 kids because I was having so much fun that I did it for random houses where I knew the kids. It was the talk of the town for a few years and I acted as surprised as everyone else in town. I have had to cut back due to health issues but I still do it for family kids up to the age of 15. Thanks for giving me a new way to "wrap" the goodies! Cool quilted look! Lovely stocking! Is is strong enough to hold a bottle of wine I asked Santa to put in my stocking! Lovely project. A fun project to try. Love the stocking, perfect for all the Christmas decorating! What a cute stocking! Thanks for sharing! I am going to have to try to make this I am not good at drawing.... yours is so beautiful!! And the stockings were hung! Wow - this is fabulous! This is a wonderful project and almost looks like paper quilting. Thanks for sharing!! Wow Just love the stocking I'm going to try and make myself one... Thanks so much..
That is so cool. The stocking is fantastic. Going to have to make one for each of our family members. Love to see such fun use for beautiful papers! Love the stocking project. Creative and fun. Thanks for the inspiration! 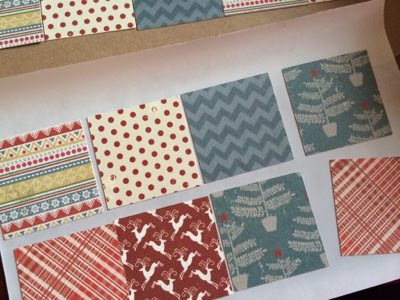 i'm LOVNG the samples used so far and they are giving me inspiration for my own christmas cards ... thank you so much!!! 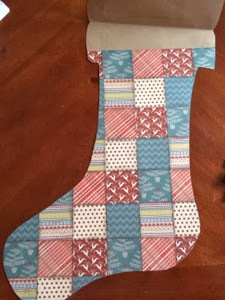 I really like that stocking project - your paper makes it very special ! I LOVE the papers (and the names of them :)) ! Beautiful stocking. This is going to be a fabulous project for me and my grandkids to make after our thanksgiving dinner this year!! Thanks so much for sharing the tutorial !! Wow, awesome stocking! Love how you wove the paper! So creative! I love this! I have made stocking with paper bags before but never thought to weave the paper...it looks stunning! tfs! This is such an awesome project! Reminds me of when I was a kit and used to make my own paper stocking for Christmas. But this one... wow! So pretty! Thank you so much for the inspiration! I never would have thought about making a stocking out of paper. It's just adorable - love the patchwork! Love the stocking. Thanks for sharing this wonderful tutrial. 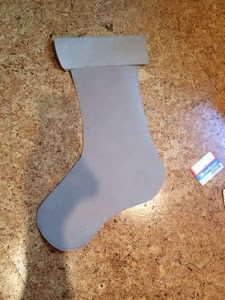 The stocking is a great project, with easy to follow instructions. Thanks for sharing in detail. What a wonderful stocking, one to emulate. Thanks for the inspiration. So pretty and creative...love the trims and papers, and the added lace at the top...love it!! What a beautiful project love it ! I love this. Going to make several in mini form. Thanks for sharing. This stocking is just too darn awesome, I love it. Wow! That stocking is amazing! Love all the individually inked squares to give the authentic patchwork look - stunning! The lace and cluster of flowers is a perfect finish! What a fun project! The "patchwork" looks great! That is a great tutorial. Looks easy enough. I might have to give it a try! What an adorable project :) Love all the inspiration on the hops! Fabulous stocking, I love the patchwork. 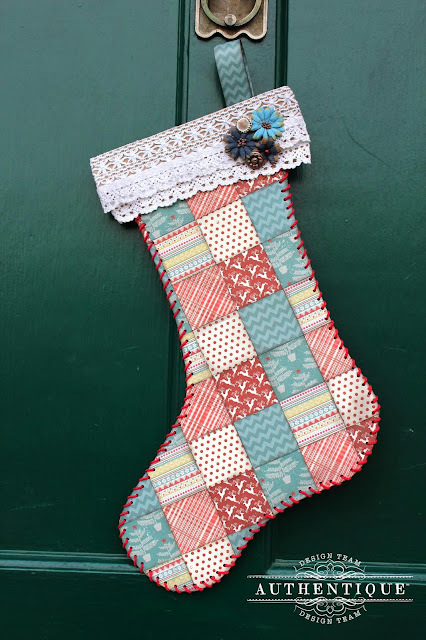 This stocking is such a fun idea and I love the patchwork quilt look of it!!! I can't wait to make a few for family and friends! Thank you. 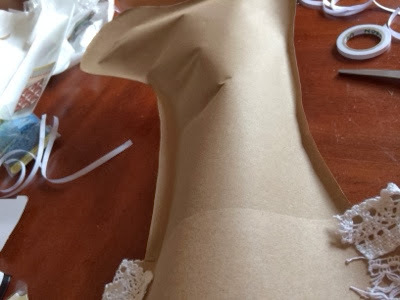 I love this stocking - and the tutorial is great. Thanks for sharing and the chance to win such lovely prizes. I love the way you weaved the papers together to look like a quilt and the stitching finishes it off beautifully! Thanks for sharing. What makes a stocking the perfect fit? Authentique and Petaloo! Love this! Love the inspiration I'm finding throughout the blog! Now if I only had the right products to make these awesome projects.....hmmmm! Thank you for the opportunity to win! 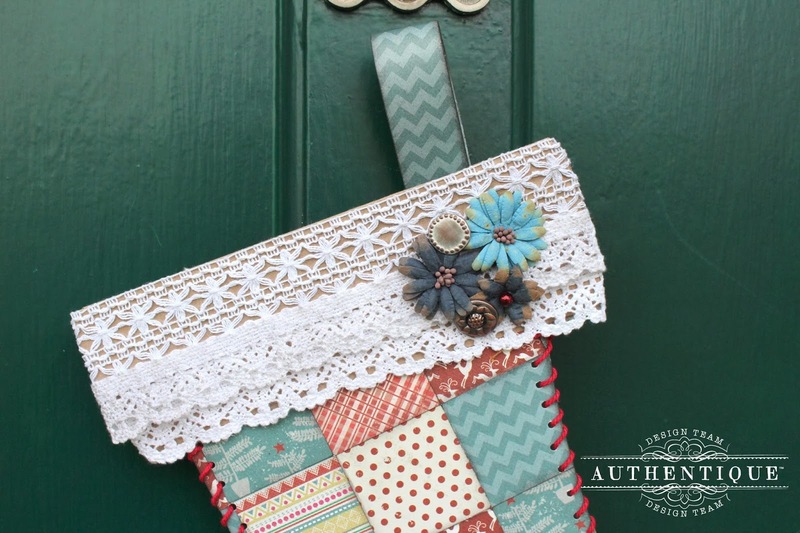 Such a fun and fabulous project - I love the woven Authentique papers and the stocking is stitched so perfectly!!! Wonderful project. Thanks for the tutorial. What a great idea. I can see these attached to the bedroom doors of children and guests. love the paper - thanks for the chance to win! I like the creative stocking♥ Beautiful mix of paper and embellishments! Very pretty. I like the mix of papers and the sewing. Great project! 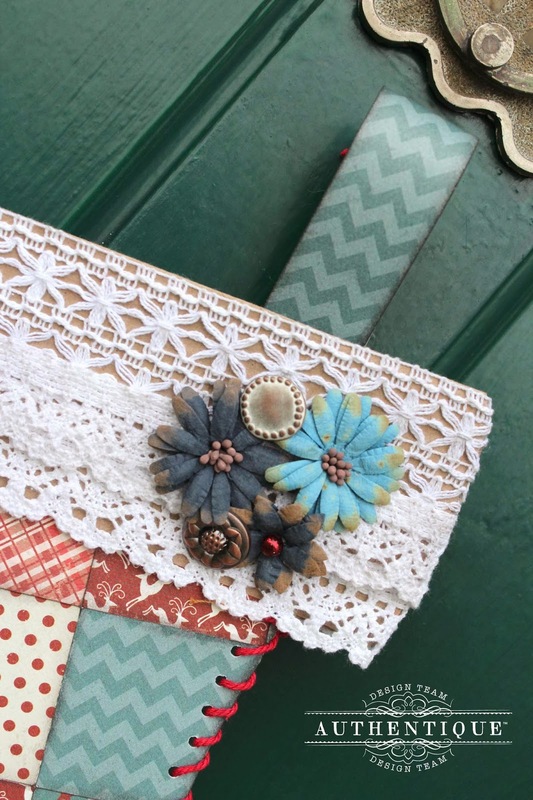 Love the papers and the beautiful trims and embellishments! I'd love to make one of these! I think I'd keep it or make another one to give. I love that you can actually put stuff in it! Great idea for all those leftover paper scraps, too. I totally loved this project for being so do-able and pretty ...and useful!! 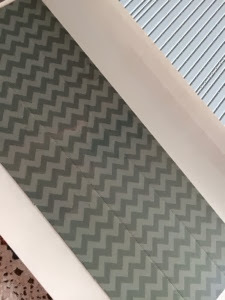 love the quilting effect with the gorgeous Authentique papers !! would really like to win some of your lovely prizes, thanks for a chance. this is awesome and I love Authentique and Petaloo together...perfect match! Such a cute idea! Would be a fun project to do with little kids before Christmas! that's a really great project. I love the inking you did, and the patters on that paper all go so well together...very "home-y" feeling to me! addition of the whip stitching was a great idea. What a neat and wonderful idea! Thanks for the tutorial! What a fun project! Thanks for sharing! 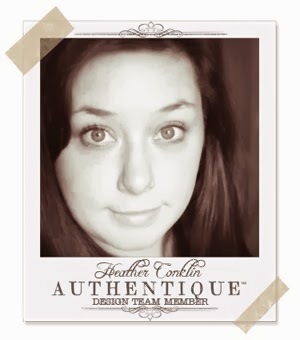 LOVE Authentique papers!!!!! Awesome stocking! Thank you so much for sharing how you made this! I love the white lace at the top too! Thanks for sharing. 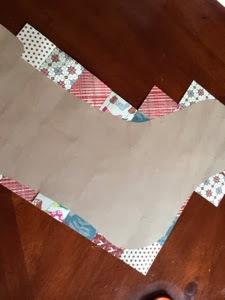 I've been thinking of making a few stockings out of paper but it never occured to me to make it look like patchwork. What a great idea! Thank you! Very sweet and a great idea to do with my granddaughter. i love making patchwork out of paper. the effects are wonderful! Beautiful stocking, I love it. Thanks for sharing. I decided I wanted to make small Christmas stockings as my gifts for my Christmas table this year but had no idea how to start. Thank you for sharing this! Well Santa will be proud of his new sock; they are for sure one of a kind ;p! I like your patchwork idea but pffuuww! Such a lot of work! I will ask Santa if he give me a sign when he needs more socks, then I'm giving my created ones next year hihi! Thank you for showing!! A simple project that looks so complex and pretty at the end. Great idea! OH MY - I have never seen a grocery bag look so DELIGHTFUL!!! SO CLEVER to add the stitching, apart from being very practical to make it sturdy, it makes it look like a traditional stocking too!!! Amazingly Authentique!! I NEVER would have thought of this! So beautiful! Gorgeous stocking - so creative. love the stocking tutorial!!! looks super fun and cant wait to try it out!! Gorgeous card and tag. Love the colors. Wow! What a wonderful idea! And thanks for tutorial!!! What an adorable stocking. Would make a great way to give some one a gift. What a cute idea, would love to re-create, thanks for sharing. a very cute paper quilted stockings!! lovely it is.. I just LOVE the stocking. I'd love to try and make one. It's beautiful. Wow....lot of work, but spectacular results! Love that patchwork pattern. So pretty and festive! What a nice stocking! Thank you so much for the detailed tutorial! The paper and colours are adorable! I really love the traditional feel & colors. Thanks for the inspiration. This is adorable! The papers are perfect for it. I'm totally in love with this stocking. Thanks for sharing the instructions. I have a pattern like this using fabric and I created it an LOVE it. NEVER did I think of doing it with PP or CS. Can't wait to make it now with these lovely PP!!! Thank you so much for sharing. What an awesome paper stocking! 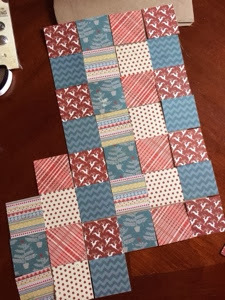 I love the papers that you chose to make your patchwork pattern out of. Very cute! What an absolutely fantastic project Heather. I love the quilted look. Thank you for sharing the details of its creation. Wow! That is one beautiful stocking! Thanks for the tutorial I will be making some of these! I love this. Such a fun idea!! Cute stocking. The patchwork look is really great.